With Microsoft PowerPoint, you can make professional-looking slide show presentations even if you do not consider yourself very technical. PowerPoint provides tools and features that simplify the process and allow you to incorporate details such as colorful backgrounds, interesting fonts and even animation. In order to create a presentation that is polished, enjoyable and easy to view, there are certain guidelines you should follow. The first step to making an effective PowerPoint presentation is selecting the slide design. Choose a design that is simple to draw your viewers to the information on the slide and not the elaborate background. Be consistent with the slide design as well. Use the same theme or template for the entire slide show. Opt for a darker background and white or light colored text. Doing so will cause the text to stand out against the background. Light attracts the eye as well, so by using a light-colored font, your viewers will immediately focus on the information you are presenting. 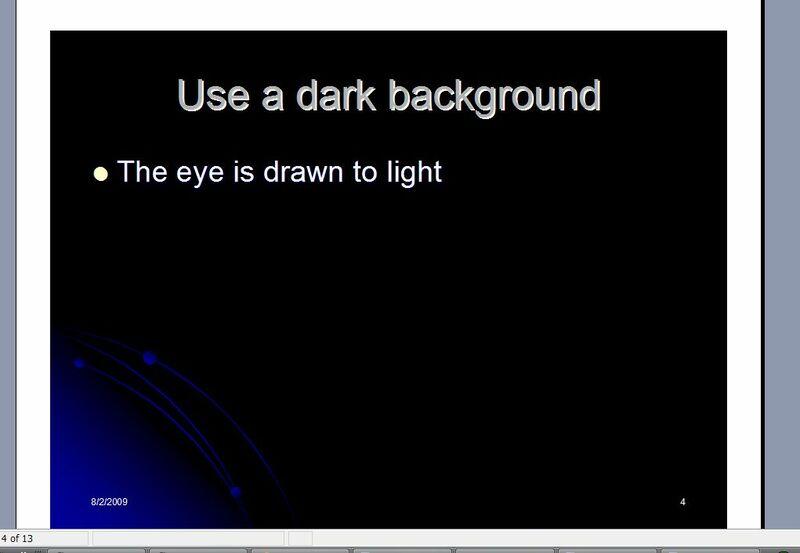 If you are printing handouts to accompany your PowerPoint presentation, change the slides to a plain, white background with black or dark text. 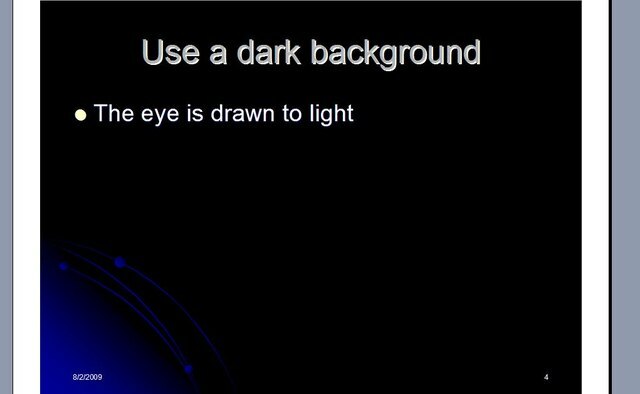 While the light text is easier to read on a slideshow screen, the dark printed text on a light background will be more legible. It will also save printer ink. 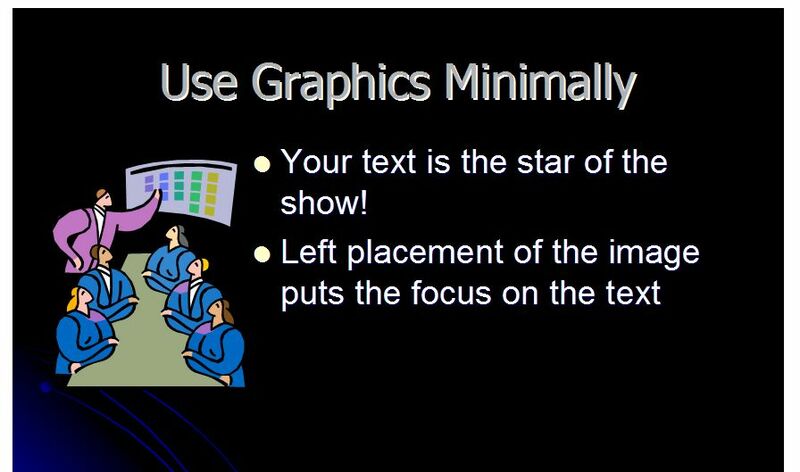 The text you enter on the slides is the primary focus of your PowerPoint presentation. Avoid typing in paragraphs or excessive information. Use bullet points for the slide show, and if you want to provide more information to your viewers, do so with printed handouts to which they can refer during or after the presentation. Stick with simple fonts. 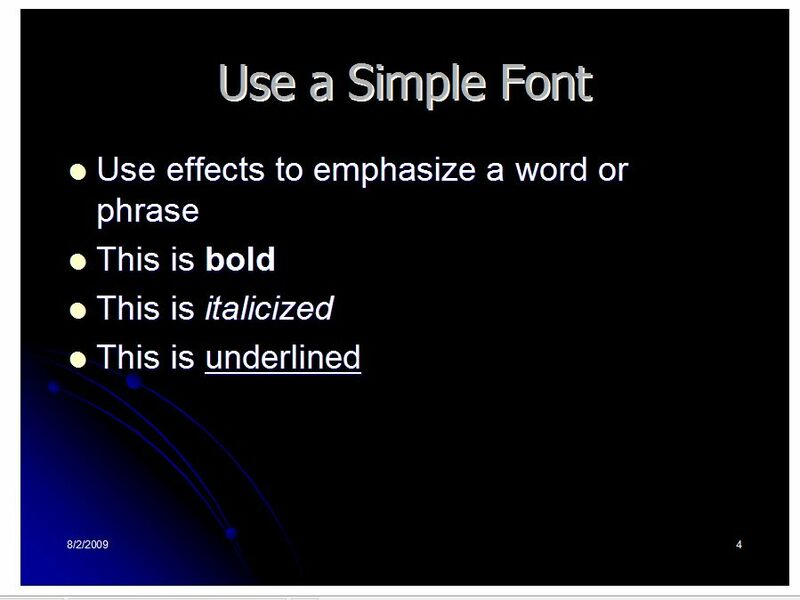 While you may be tempted to use a fun or fancier font, it is important that the information on the slides is legible to the viewers. A "Sans Serif" font such as "Arial" or "Tahoma" make small segments of text, such as bullet points, easier to read. 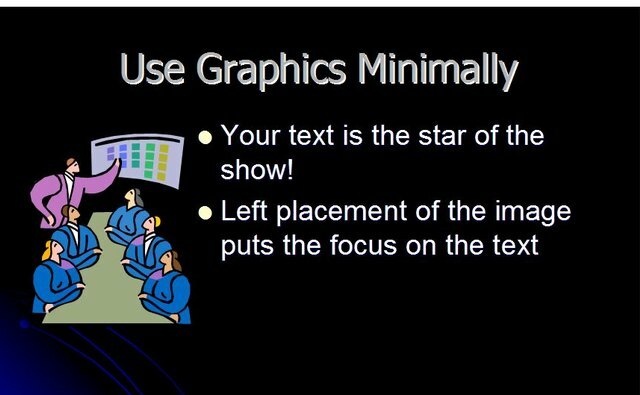 Keep the font consistent throughout the PowerPoint presentation. 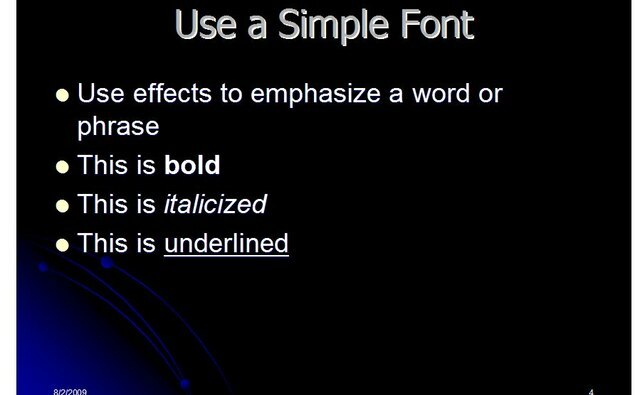 If you want to emphasize certain words or phrases, make the font bold, italicized or underlined rather than using a different font. Consistency will lend your slide show a more polished appearance. Use graphics and animation sparingly, if at all. Graphics should be limited to one per slide, and using a graphic on every third or fourth slide is sufficient. Always place a graphic to the left of the bullet points on the slide. Your viewers will be attracted to the graphic first. If you place it on the left, viewers will naturally look from the picture to the text. If you decide to use animation, be consistent. Select one animation scheme to use throughout the slide show, and then only employ it to emphasize key points of the presentation. When creating a PowerPoint presentation, the best guideline to remember is "Less is more!"